When Anu Tali conducts, you don’t just hear the music; you see it. Each wave of her arms, shrugs of her shoulders, and staccato movements of her baton communicate how she wants you to listen to the story the orchestra tells. Members of the Estonian Society of Central Florida, joining a full house, were treated to an exhilarating musical experience at the Sunday, November 10, 2013 performance of the Sarasota Orchestra conducted by new musical director and conductor Anu Tali. In fact, all three performances launching the orchestra’s 2013-14 Masterworks series in the Van Wezel Performing Arts Hall were sold out. 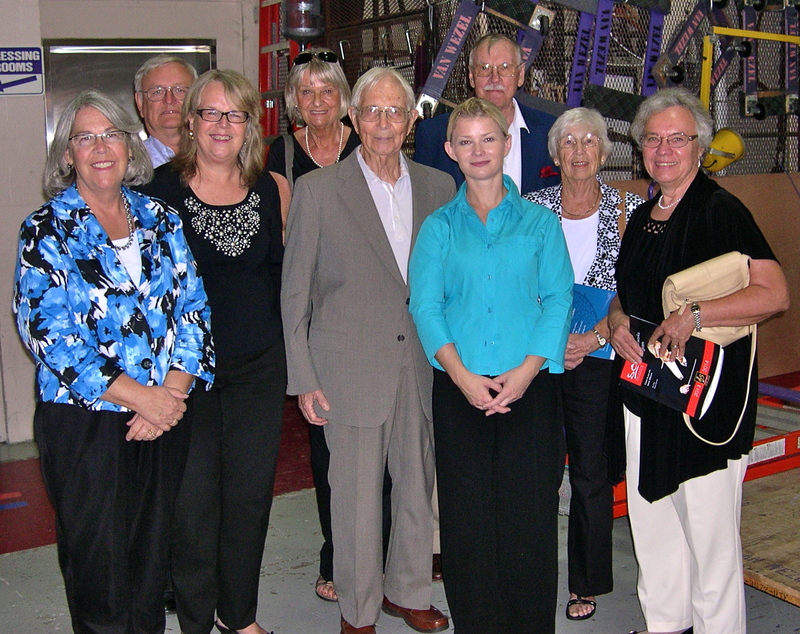 KFES members congratulate Sarasota Orchestra Music Director and Conductor Anu Tali at the start of 2013-14 Masterworks season. Front row: Lisa A. Mets, Monika Orumaa Craig, Väino Aare, Anu Tali, Leena Aare, Kersti Linask. Back row: Erkki Taada, Ingrid Shipotofsky, Tiit Treude. Sarasota, November 10, 2013. This year the Sarasota Orchestra, known first as the Florida West Coast Symphony, celebrates its 65th year. Ms. Tali is only the fifth conductor to lead this exquisite ensemble of talented musicians. The works selected for her debut reflected Ms. Tali’s Estonian heritage and education as a student at the Tallinn Music High School, Tallinn Conservatory, Estonian Academy of Music, Stockholm Music Gymnasium, and the St. Petersburg State Conservatory. Ms. Tali opened the concert with Heino Eller’s Koit (Dawn), composed between 1915 and 1920, the period of Estonia’s own great national awakening. The audience quickly settled down to enjoy this melodic tribute to nature. Well paired with the opening, Rachmaninoff’s romantic Rhapsody on a Theme of Paganini, Op. 43 followed. Piano soloist Lukáš Vondráček gave a stellar performance supported by an orchestra that matched the lightning speed of his finger work. After intermission, the official program concluded with Dvořák’s Symphony No 7. According to Sarasota Orchestra program notes, Dvořák said his new symphony “must be capable of stirring the world.” It certainly stirred the audience to communicate their appreciation with a standing ovation at its conclusion. Reciprocating with its own show of appreciation, the Sarasota Orchestra offered a spirited Brahms’ Hungarian Dance No. 6 as its encore. After appearances in 2011 and 2012, Ms. Tali’s arrival this season was highly anticipated and great expectations are in order. The audience’s enthusiastic and extended applause—from her first appearance on stage to her exit after the encore—signaled their great affection for their orchestra and their new music director and encouragement for great things to come from this union. The Estonian Society of Central Florida (Kesk Florida Eesti Selts) is especially excited to welcome this new member to our community. Ms. Tali guest conducts the Eesti Riiklik Sümfooniaorkester in Ft. Lauderdale (FL) on Saturday, November 16, 2013. Her next program with the Sarasota Orchestra, Homage, is scheduled February 20-23, 2014; tickets are available through sarasotaorchestra.org.